Eternal city: Townsville diocese parishioners outside St Peter’s Basilica in Vatican City on their World Youth Day pilgrimage; and (below) praying on their way to WYD. BRIGHT and early one morning in July, 35 young and not so young Townsville diocese parishioners gathered at Brisbane International Airport to begin their pilgrimage to the Heart of Mercy and World Youth Day in Krakow, Poland. The diocesan group was made up of 22 from Mount Isa and 13 from the Townsville area, all of them looking forward to the journey of a lifetime. “For some of these young people this will be their first time out of Queensland, let alone Australia and we are going to experience many graces and wonderful gifts during this pilgrimage,” diocesan administrator and Good Shepherd Mount Isa parish priest Fr Mick Lowcock said. First stop on the journey was Florence where the pilgrims had Mass at the historic Cathedral of Santa Maria dei Fiore and the Basilica of Santa Croce. “It’s only day three and we have made some amazing memories already and our faith has been strengthened,” Mount Isa pilgrim Clare Patmore said. The group then travelled to Assisi and then on to Rome. While in Rome the group entered the Holy Doors at St Peter’s Basilica and visited the major basilicas in Rome as well as other historical sites. A highlight was meeting Claudio, from the Community of St Egidio. The group was fortunate to witness the community’s acts of mercy in serving the poor through its soup kitchen and to attend prayer in the Basilica of Santa Maria, the same church Pope Francis shared with the poor last Christmas. On the group’s final day before heading to Poland, Fr Lowcock had organised a Mass to be celebrated by former apostolic nuncio to Australia Archbishop Paul Gallagher in St Peter’s in the tombs of the popes. Upon arriving in Krakow for World Youth Day, Mount Isa pilgrim Moyita Clapham said: “Our bonds between everyone from all the different towns are getting really close and strong by the days we spend together. “Being a part of a great bunch of young people and leaders is just amazing; they have pushed us to be happy to talk about our faith and know that no one will judge you for your faith,” she said. 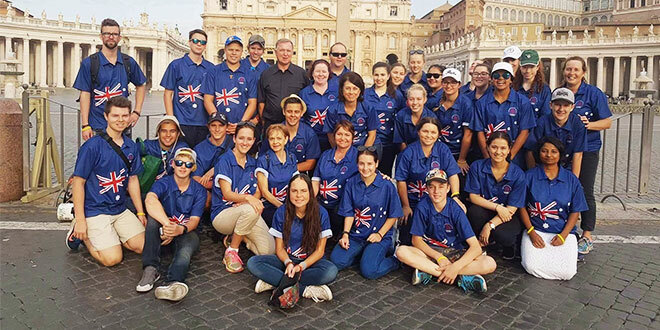 During the World Youth Day activities the group joined in with the other 3000-strong Australian contingent at the Australian gathering as well as the other 2.5 million pilgrims from around the world in the vigil and final Mass with Pope Francis. After the final Mass, Ayr pilgrim Julia Zanella said: “Often we see so much violence and hate in the media, but today we experienced and witnessed God’s love and peace. It is alive. “Every single person is smiling, singing or saying hello. “Language, colour or nationality is no barrier. Preparations for World Youth Day 2019 in Panama are already under way.